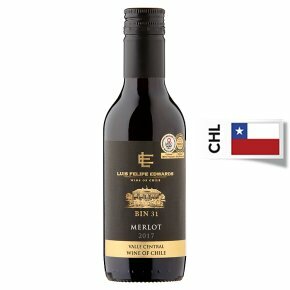 Wine of Valle Central, Chile. International Wine & Spirit Competition Quality Award IWSC Trophy 2012 - Chilean Wine Producer. International Wine Challenge AWC Vienna Trophy 2013 & 2012 - Chilean Wine Producer.Merlot - Red Chilean Wine Wine of Chile Warm, reliably sunny days and cool, refreshing nights create the perfect climate to make world class wines. This rich-flavoured Merlot is smooth and long, and an ideal partner for roast chicken, pasta, grilled meats and sausages. This rich-flavoured Merlot is smooth and long, and an ideal partner for roast chicken, pasta, grilled meats and sausages.